In this example, the implementation for iterating over a Page List in Pega 7 Data Transform is described. A data page that uses a Page List structure is used as an example. See this example on how to create a data page using the Data Table Wizard. 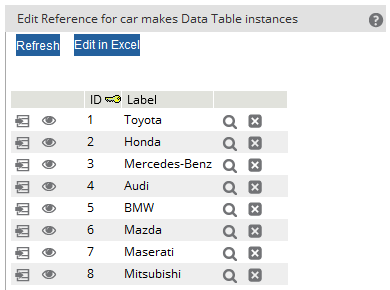 The page list data page is backed by a data table of car makes and is used here to show how to iterate over its entries in a data transform. The screen shot below shows an example of a Data Table. In this case, the rows represent car makes. See the link under Related Posts on how the data table was created. The data table contains instances of the class ABC-Insurance-Data-Make. This class has the properties ID (Integer) and pyLabel (Text). The ID is a unique identifier (Key) and the pyLabel property contains the actual car make values. Node scope causes the data page to be available to all users on a node (i.e. it will be loaded once per PRPC node). The Data Table Wizard creates a default Report Definition. Here it is named dataTableListReport and it returns all rows in the underlying data table. The data page can be unit tested by clicking on Actions > Run. The XML of the data page will be shown and the node pxResults (a PageList) will contain all of the rows in the data table. After running the data page once, it will appear in the Clipboard Tool under Data Pages > Node. Due to its Node scope, the data page D_Makes will remain on the clipboard until the PRPC instance is restarted or the data page is deleted using the Designer Studio or the Clipboard Tool is used to delete it (see the Actions button in upper right-hand corner). 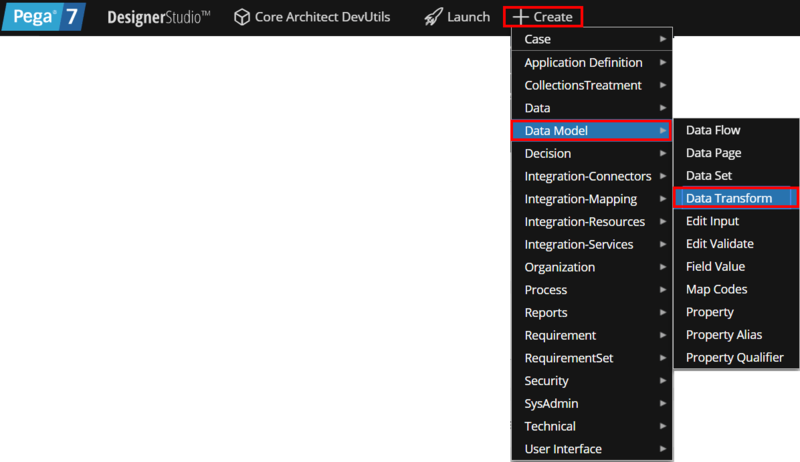 In Designer Studio, create a data transform using +Create > Data Model > Data Transform. The Data Transform Record Configuration form requires the user to enter a name, here it is IterateOverMakes and to select an Apply to class. 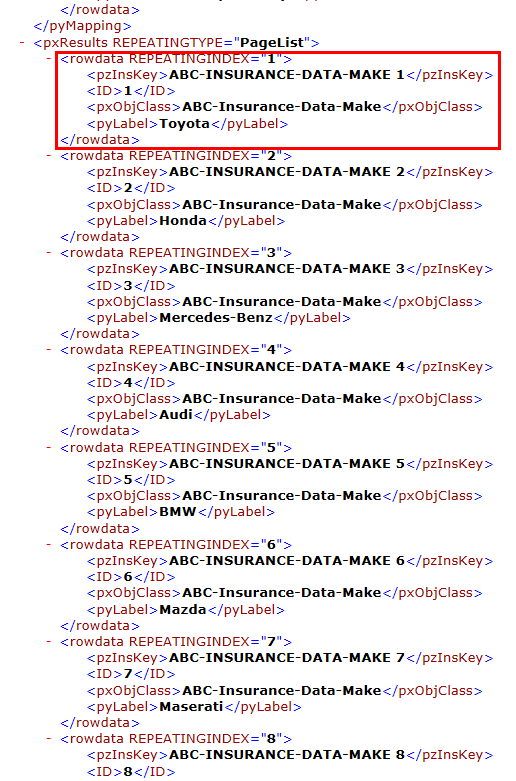 Here, the class is ABC-Insurance-Data-Make. Click on the Create and open button to create the data transform rule. On the Parameters tab, an output parameter named MakeString of data type String is defined. It will be used to return a comma-separated String of car makes that is created by the data transform while it iterates over the data page D_Makes. 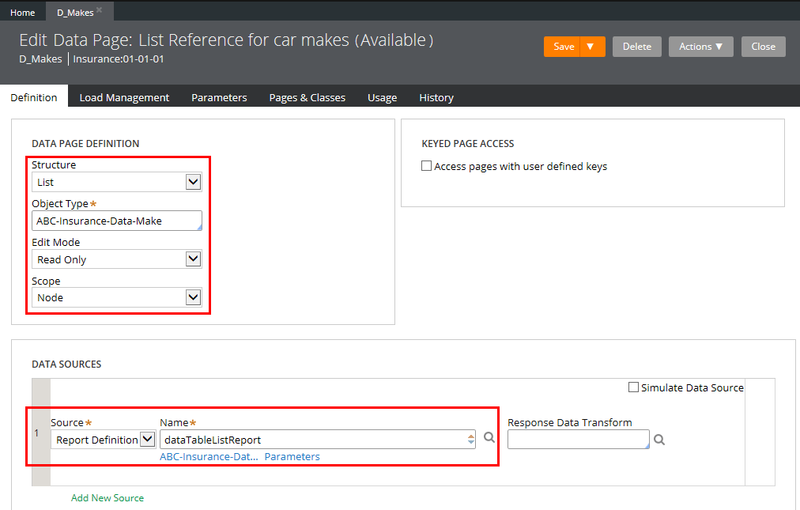 On the Pages & Classes tab, the data page D_Makes needs to be listed with a class of Code-Pega-List. The class Code-Pega-List has a page list property named pxResults which holds instances of the object type specified when the data page was configured. Here the object type is ABC-Insurance-Data-Make. Specify the class of D_Makes.pxResults as shown below. On the Definition tab, the first row will use the action For Each Page In to iterate over the D_Makes.pxResults page list. The checkbox Also use each page as source context in the Source column should be checked so that the . dot operator can be used to refer directly to the current page of the iteration instead of having to use D_Makes.pxResults(<CURRENT>). In the second row, param.MakeString is concatenated with the pyLabel property of the current ABC-Insurance-Auto-Make instance. Save the data transform and open the Tracer. 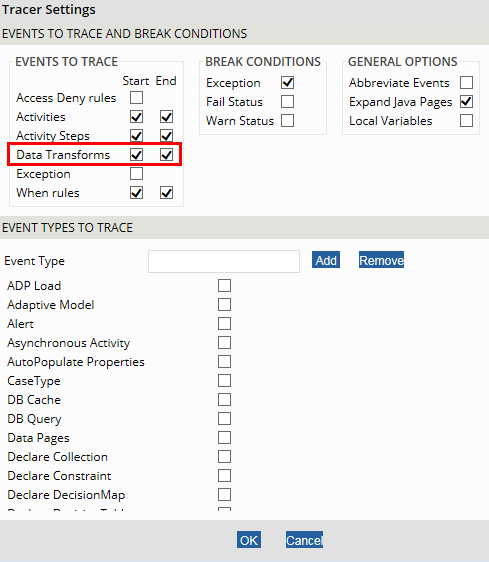 Make sure that the check boxes for Start and End for data transforms under the section Events to Trace are checked. The data transform can be unit tested by selecting Actions > Run and then clicking on the Execute button in the new window. Note: Make sure that the Tracer is running before executing the data transform. A new window opens and shows XML output from executing the data transform. The pzStatus will contain the value valid if the exeution was successful. Switch to the Tracer window and search for the row where the event type shows Data Transform End and click on that row. 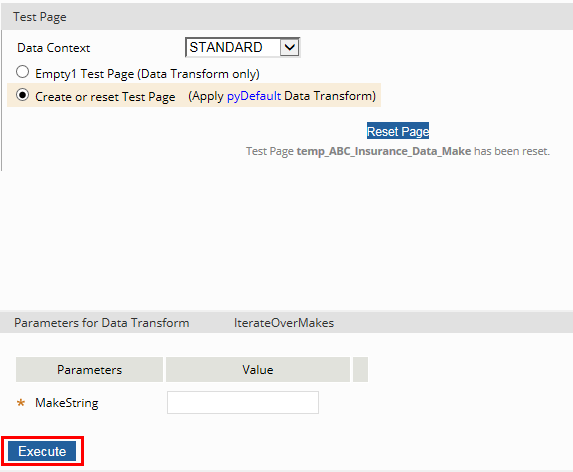 A new window opens, showing the properties of the test page that was created for running the data transform. 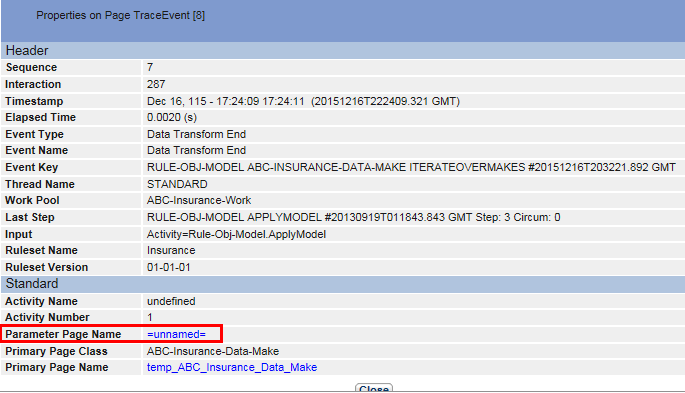 Click on the link =unnamed= link of the Parameter Page Name property in the TraceEvent page. This will open the TraceEvent[=unnamed=] page, showing the output parameter named MakeString which was set by concatenating the car make values while iterating over the data page D_Makes to generate a comma-separated String value of the car makes. The page also shows some Pega out-of-the-box properties, prefixed with py or pz. In the below screen shot, a property named pyForEachCount with a value of 8 is shown. This is the number of iterations that were executed by the For Each Page In data transform action (i.e. the number of items in the D_Makes.pxResults list). Note: The tracer also shows that Code-Pega-List maintains the order of the entries in the data table. Pega is implemented in Java and the underlying Java interface- and implementation classes for Code-Pega-List are java.util.List and java.util.ArrayList from the java.util package. Very Good Explanation and the screen shots are extremely helpful to reinforce the concepts and the learning. Very Nice Explanation with screenshots. Could you similarly do an explanation with screenshots for VerifyProperty, VerifyPropertywithLisitng, Apply-Data-Transform and Map-Structured.